Every goddamn day: 04/18/19: "Real good for free." I admire anybody who has the gumption to take their talent out on the street. Because there, you are unfiltered. You see the indifferent people hurrying past, grasp just how few pause, how easily the skill you've devoted your entire life to can be ignored. It's hard enough when you have a screen -- I write for a newspaper, and they pay me, and the people who read it either pay the newspaper or gaze upon its advertisements. But they're far away, generally. I'm shielded from their reactions, for the most part. I don't know if I'd have the balls to take a stack of photocopied columns and stand on the street corner and wave them at passersby trying to entice one to give me a buck. Actually, that's a lie; I do know -- I wouldn't, I couldn't do it. I suppose because no one would pause, never mind give money, or just a few would, out of confusion and pity. It would seem not bold on my part, but sad, even pathetic. Somehow, this mother and daughter, playing beautifully on Michigan Avenue, did not seem sad or pathetic. There was something artistic, pure, even noble about it. I'm not the first one to notice the brave dignity of the street performer. There's a beautiful, though obscure Joni Mitchell song, "Real Good for Free," (okay, I guess they're all obscure now) dedicated to a guy who played clarinet on the street in New York while the crowd hurries by. Mitchell sums it up with the line, "They knew he had never been on their TV, so they passed his music by," a succinct way of saying that most people need someone to tell them what is good. They have a hard time figuring it out themselves. In its raw public form creativity, no matter how well-wrought, is "art without a frame," as my pal Gene Weingarten put it in his brilliant article, "Fiddler in the Subway," where he coaxes star violinist Joshua Bell to play in the Washington Metro. Bell plays for 43 minutes on his $3.5 million Stradivarius, more than a thousand people walk by, "cups of coffee in their hands, cell phones at their ears, ID tags slapping at their bellies, a grim danse macabre to indifference, inertia, and the dingy, gray rush of modernity," as Weingarten describes it. So give the next musician you see in the street a dollar or two. You'll be taking part in something very old. Because before there were orchestras, before there were concert halls or recordings or contracts or scholarships, there were musicians and their instruments, or singers and their songs, on a street corner, and the people passing by, either pausing or, more likely, not. Playing in the street isn't always a matter of need. 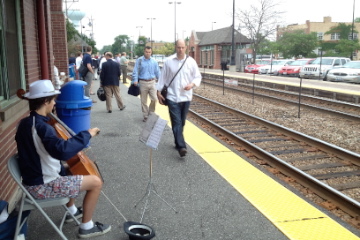 This cellist was at the Northbrook train station earlier in the summer. He's in my younger son's class at Glenbrook North High School. I only had a minute to listen, before the train came, and didn't get a chance to ask. I wish I had; I assume he was there on a lark, because he only came that morning and never returned. But still, kudos to him. If I taught teenagers, I would insist that they master something and spend an hour doing it in public for change. It would be a challenge—maybe too much of a challenge. Even Joshua Bell, who played in the great concert halls of the world for queens and presidents, admitted he was scared to stand at the L'Enfant Plaza Metro stop and play for commuters. Scary, but also liberating, freeing us from our fears, from that inhibition, that chain, the almost physical dread of embarrassment that holds so many people back from doing what they want to do. Four years ago I found myself in London, at Hyde Park's famous Speaker's Corner. Recognizing an opportunity that would never come again and that I would hate myself for missing, I stiff-armed my reluctance and hopped up on a milk crate to harangue the passing crowd. Only briefly, a little impromptu speech about America. But when I stepped down off the crate, grateful and grinning, I was thrilled, as if I had done something incredible, and I suppose, for me, I had. Gene Weingarten sent me this amazing coda, how his Joshua Bell piece had been done decades before, in Chicago coincidentally enough. It also contains a link to the Pulitzer-Prize winning story. You can read it by clicking here. I wish the USA had a five dollar coin, like the Swiss five franc coin - worth 5.35 U$D - so I could toss it into the open music case. I would carry a supply for just that purpose. Gotta disagree with you here, Neil. The fact that only 7 people stopped to listen to Joshua Bell tells you all you need to know about this. Few, if any, are interested in stopping for a concert on their way to the train, as you demonstrated yourself in the reference to the high school kid in the ole leafy suburban paradise. (The mother and daughter in the main picture at least have the good sense to be playing in front of the Art Institute, where people do sit on the steps and chill for awhile.) Anyway, I think your reference to "confusion and pity" explains why people give street performers money. The same way some WOULD give you money for a copy of your column, some give money for a Streetwise that they may not really want, and some give money to people based on them simply asking for it. If it had much to do with an appreciation for talent, or the "brave dignity of the street performer," Mr. Bell would have ended up with a wad of cash for his efforts. Which is not to take away from the talent of many of these performers. But I don't really agree that people who play on the street for an audience that neither requested, nor may appreciate, the music or their performances, necessarily deserve to be rewarded by all. @Jakash: I see your point. But WHY are people disinterested in stopping for a concert? How many really have a boss with a watch waiting for them? At the end of the day, I see all my fellow commuters storm across the tracks before the gates go up, because they can't wait the 10 seconds, and it isn't as if supper is burning. We have this automatic busyness hardwired into us. Maybe it is hardwired, Neil. But how popular are solo violin or cello performances of any kind? Why would people who never set foot in Orchestra Hall be expected to take twenty minutes to listen to the folks in your photos, or even Joshua Bell, for that matter? I try to avoid cliches unless they are literally true. For instance, I once said, "What is this -- Grand Central Station?" while standing in the middle of Grand Central Station. A kind of humor. But that was accidental. My favorite part of the Weingarten story is that one of the passersby did recognize Bell. She stopped and listened for a few moments and then asked if the performer was indeed Joshua Bell. After being assured that he was, in fact, Joshua Bell, (if my recollection is correct) she nodded appreciatively, dropped a few bucks into his violin case and continued on to her train. Robert, the one that got me was the guy who trained to play professionally, but gave it up, listened in awe and said he had never heard a violinist of that caliber before. Also recognized that the violin itself was of highest quality. He was a fan of Bell, but didn't recognize him. Bill, my brother Stuart was a busker of some note in his youth. He even performed in a band called the Laketown Buskers for a while. He's now more well known as a folk musician and music impresario. When he was younger he supported himself busking across Europe. Upon arriving home he tried the same thing at the Old Orchard shopping mall. Cue the frantic gossip among the Skokie ladies: "Did you see Beverly's son BEGGING at Old Orchard?" Much hilarity ensued. Neil, I've read several books that you have recommended and "Fiddler in the Subway" was definitely the most memorable, not only for the Joshua Bell story but also for the haunting "Fatal Distraction". My book club group, all retired teachers, had but one lament: "I wish I could write like that." Carolyn...I completely agree. I shared the book with a few parents and warned them about that story. Neil, thanks for recommending that book. It's on my all-time favorite list. Me too. 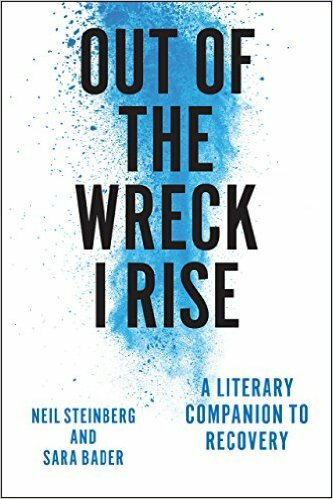 Whenever I read a Gene Weingarten piece, I flash with admiration, then sigh, feeling as if I've wasted my entire life.